As Rosrybolovstvo (Russian Federal Fisheries Agency) told IAA PortNews, the investment quota programme (“keel quota” programme), foresees the construction of 22 fish processing plants and 33 large and mid-size fishing ships. Investments of Far East companies into construction of ships is estimated at RUB 41 billion, North region companies – RUB 64 billion. Shipyards have been determined for all construction projects. Admiralteiskie Verfi shipyard will build six 108-meter long processing trawlers for Russian Fishery Company headquartered in the Far East. Three 50-meter long trawler-seiners will be built by Yantar shipyard for Kamchatka based Fishing Collective Farm named after V. Lenin. Severnaya Verf shipyard has signed contracts for construction of nine ships: two 58-meter longline factory vessels for Fishing Company “Virma” one ship of the same project for Globus LLC; six processing trawlers of 81 meters in length (two for Rybprominvest JSC, and one for Karat-1 JSC, Alternative JSC, Karelian Seafood JSC and Murmansk Region Fleet JSC). Vyborg Shipyard will build four 86-meter processing trawlers for Arkhangelsk Trawl Fleet JSC and one 80-meter processing trawler for each of the following companies: LKT Company LLC, Nord Pilgrim LLC and Atlantrybflot as well as two trawlers for Fishing Company “Virma” . 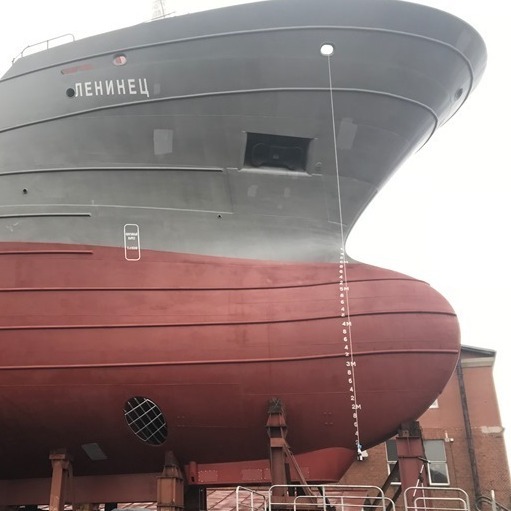 Pella shipyard will deliver four refrigerator trawlers of 69 meters in length under investment programme: two for Murmanseld 2 CJSC and one for Fishing Company “Zarya” and Andromeda LLC. Yaroslavsky Shipyard has signed a contract with Murmansk based companies Eridan and Strelets for construction of two mid-size refrigerator trawlers (61 meters each). Vimpel Shipyard has signed a contract with MTC Karelryba LLC for construction of one small freezer trawler (35 meters). The degree of completion of some ships is very high. Yantar Shipyard started mooring trials of the lead ship of Project SK-3101R, Leninets, in late January 2019. The vessels’ technical readiness exceeds 90%. The ship was laid down in July 2016, launched in November 2017 with the delivery scheduled for Q1’2019. Two more vessels of the series, the Komandor and the Udarnik, have also been launched and are being prepare for mooring trials. On 26 December 2018, Pella shipyard (Leningrad Region) held a ceremonial launching of the lead crab catching vessel of Project 03070, Rus, Russia’s first ship intended for crab catching. That sophisticated project was developed by Pella design bureau together with the customer, Antey LLC (Far East). The shipbuilding contract was signed in June 2017. The construction is to be completed in Q3’2019. 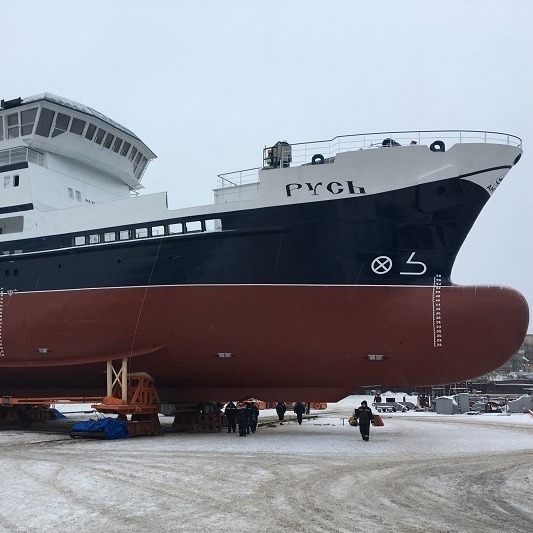 On 5 December 2018, Vyborg Shipyard (a company of United Shipbuilding Corporation) held a ceremonial launching of the lead processing trawler of Project KMT01. The ship named Barents Sea is being built to the order of JSC Arkhangelsk Trawl Fleet. Economic effect of the “keel quota” programme is forecasted to at the level of at least one third of total investments. Local manufactures and import substitution is crucial for construction fishing ships. According to the Russian legislation, shipboard equipment of domestic origin should account for at least 30% of the total ship cost. As IAA PortNews learnt at the shipyards, the share of Russian equipment will not exceed the minimal level of 30% in most cases. For example, the Rus will be built with the use of Russian metal, shipbuilding steel, pipes, cables, transformers, insulation materials and paints. As for paint, it will be supplied by a plant built by Norwegian manufacturer Jotun in the Leningrad Region. Yet, there are examples of higher local content: longline factory vessel of Project МТ1112XL (Severnaya Verf) - 40%; lead trawler of Project СТ-192 - 60%. Apart from large fishing ships, Russia needs to renovate the fleet of small-size fishing vessels which cannot be done without state support. Mid-size and small-size ships involved in fishing in the Azov-Black Sea Basin, Volga-Caspian and Western Basins are worn out with their average age of over 30 years. Nikolai Shablikov, Deputy Head of the Department of Shipbuilding & Marine Engineering, RF Ministry of Industry and Trade, has recently said that state support mechanism provides for signing of a contract between a customer and a shipyard with a 10-pct coverage of construction costs. Then, a contract is to be signed between a customer and the Ministry of Industry and Trade with the terms of subsidizing. The subsidies are to make 25-30% of capital costs. Besides, the programme can cover ships laid down in 2018 before introduction of the new measure. The first phase of the programme will cover the construction of about 30 ships. The Baltic Sea Basin will obtain vessels of several types, including those of ADOMAT and KNARR Projects. Seven units are needed for that Basin. As following the Azov-Black Sea Basin, there is a plan to build 10 ships. Four different projects are under discussion (Project 82185 is among them). Besides, there is a demand for vessels servicing sea farms. Development of local construction is under discussion. Special attention should be paid to the Volga-Caspian Basin. A fish processing plant is to be opened in Makhachkala in 2019. Besides, Rosrybolovstvo is looking into construction of such ships in the Far East. All in all, state support measures are to cover the construction of up to 120 small-size ships in 2020-2025 including about 100 catching ships and 20 servicing ships. The scope of additional financing is estimated at RUB 14.4 billion. The programme will attract about RUB 48 billion of private investments. In total, “keel quota” programme will ensure the construction of about 200 units. The programme will also contribute to the development of related manufactures facilitating phasing out of imports (components and materials) thereby ensuing a synergetic effect for the industry as a whole.